OK, OK I know I"m kind of on a roll here with salads but I had my left over Arugula so I thought I would make this. This is definitely one of the better things I've made in our marriage. A tad laborious but definitely worth the mix of flavors and textures. The recipe I made did not call for feta like what's pictured here but I bet it would have been great with some feta or bleu cheese crumbles in it. I hadn't planned on Beau eating any because he doesn't like a lot of the stuff in the salad but he had some and loved it! Bring 4 quarts of water to a boil in a large pot with a 1/2 tsp. salt. Once the water is boiling, stir in wheat berries and partially cover. Cook for one hour, stirring often, until wheat berries are tender but chewy. Meanwhile, prepare the dressing by simmering the orange juice in a small sauce pan until reduced to 1/3 cup, about 15 minutes. Pour reduced orange juice into a small bowl and cool in the refrigerator for about 10 minutes. Whisk together the cooled orange juice reduction with the cilantro, lime juice, water, oil, agave nectar, cumin, garlic, salt, paprika and cayenne pepper. Set aside. 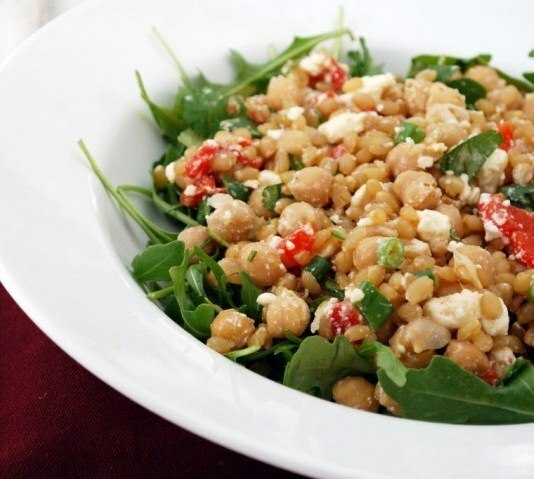 To assemble the salad, toss the chickpeas, red peppers, olives, and wheat berries in a medium bowl with half of the dressing. Salt and pepper to taste. In a separate bowl, toss arugula with remaining dressing. Divide among 4 plates and top each with 1 cup of the wheat berry mixture. If you are making it ahead of time or plan on having leftovers the next day, do not toss the arugula with the dressing ahead of time. Simply pour the dressing on top of arugula right before serving.